The Black Widow edition of Avenger Powerfruit Punch Soda is the refreshing way to show your support for the Marvel fandom! 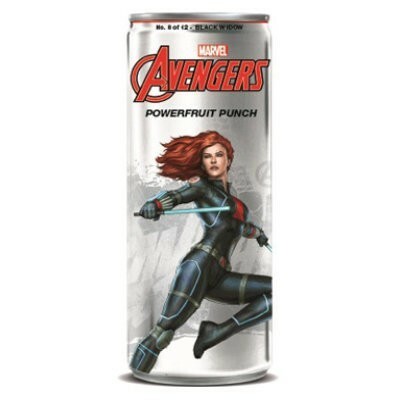 Get your girl-power on with this fruit punch-flavored, bubbly beverage whose can art celebrates one of Marvel’s first female superheroes! Collect the whole set for the ultimate gift for your favorite comic book fan! Don't wait! Only 4 in stock! Water, concentrated juices (black currant (6,5%), pomegranate (3,5%), cranberry (1,8%), chokecherry (0,1%), blackberry (0,1%)), acidity regulators E500ii-E330, flavors, sweeteners E952-E955, concentrated carrot color, acai extract, vitamins B3-B5-B6-B1-B12. Contains GMO. Nutrition facts (for 100ml): calories 4Kcal, total fat 0g (saturated fat 0g), total carbohydrate 4.2g (sugar 0.8g), protein 0g, salt 0g.